In this previous post, I have reviewed control-flow constructs available in CPAL. Yet, I had purposely omitted Mode-Automaton. 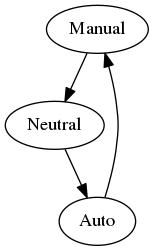 Finite-State Machine overview of a servo tester. Seen as a black-box, the servo tester has 2 inputs — a potentiometer and a button — and one output — the servo signal — (well the same one duplicated). So in CPAL, I will declare a process with two inputs and one output. Let’s not focus on parameters’ type yet. and when position = int32.LAST then position is maximum. NB: This is the kind of views that our editor displays automatically while typing. 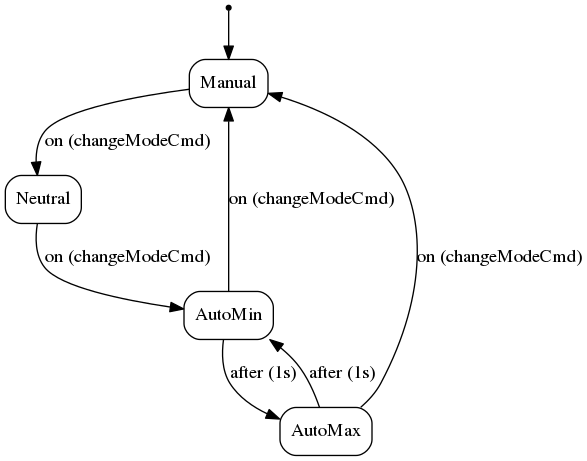 In this post, I have begun to dig into mode-automaton which is a powerful and non-ambiguous way to express the logic of the code, and graphical representation helps a lot for the understanding. But CPAL can do much more and that will be the subject of other articles. By now, you can follow us on Twitter or give a try to CPAL.